The first time I tasted brussel sprouts, I absolutely loved them. Jamie had braised them with bacon and apple cider vinegar and they were, quite simply, fantastic. I also adore them roasted since the outer leaves get nice and crisp in a really hot oven while the center stays tender. Those crispy bits are the best bites. 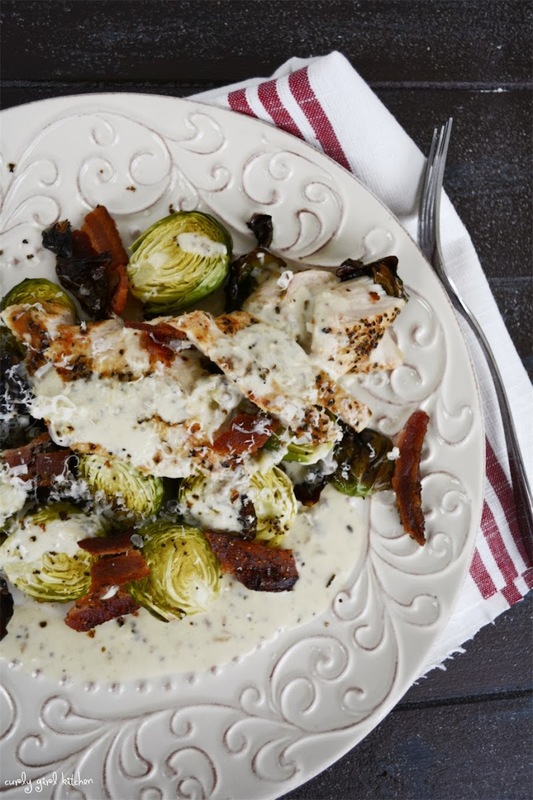 A few weeks ago, my sister texted me that she had seen a recipe for a warm brussel sprouts salad with bacon flavored croutons, and it was all she could think about. And suddenly, brussel sprouts were consuming my thoughts, too. You might think it's strange, this craving for a vegetable that tends to have such a bad reputation, but I really believe that if you don't like brussel sprouts, you must be cooking and eating them all wrong. Try roasting them. Really. Add some bacon. Or a little vinegar. They're both quite nice. 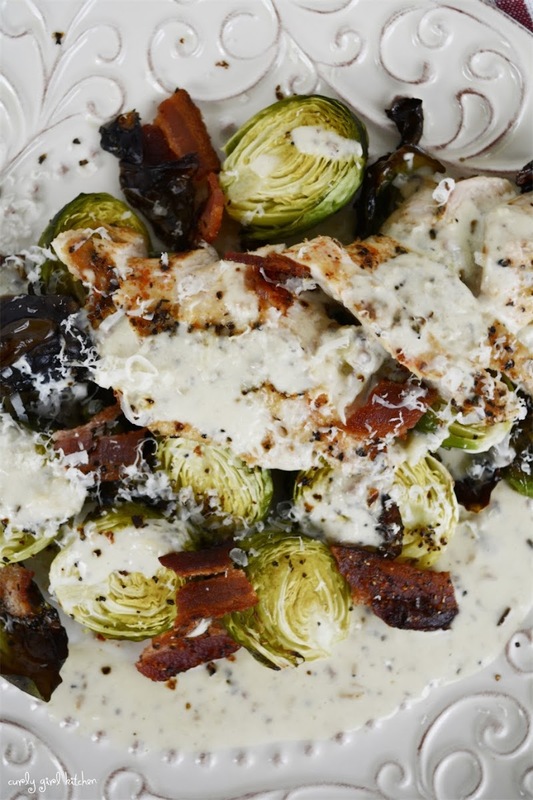 While roasting the brussel sprouts with olive oil, smashed garlic and a sprinkling of salt and pepper, I cooked bacon until it was crisp, and then cooked thin chicken breasts in the bacon fat. You'll find many variations of recipes for Caesar dressing if you go looking, but the basic formula is anchovies, egg yolks, olive oil, Parmesan cheese and lemon juice, maybe with a little mustard, garlic and black pepper. Typically, it's served on romaine lettuce with croutons and shavings of Parmesan cheese. Ideally, the egg yolks and oil create an aioli (think mayonnaise), but personally, I've never had much success with homemade aioli, and it ends up just being overly oily. So although I still add egg yolks for their creamy richness, I don't add any oil to my Caesar dressing, other than the little bit that comes in the metal tin of anchovies; instead I like to use a dollop of Greek yogurt and some buttermilk. And in case you think you need to add salt to the dressing, please don't, since the anchovies and Parmesan cheese contribute more than enough salt on their own, and too much salt can quickly ruin a good dish. The garlic that I roasted with the brussel sprouts made my dressing pretty special, with its lovely caramelized undertones and none of the bite of raw garlic. Preheat the oven to 400. Cut the brussel sprouts in half and place in a single layer on a baking sheet along with the garlic. Drizzle with olive oil and season with salt and black pepper. Roast for 30 minutes, until tender and the edges are crisp. Meanwhile, heat a cast iron skillet over medium heat and cook the bacon until crisp; drain on paper towels. Season the chicken on both sides with salt, black pepper and cayenne pepper and cook in the hot bacon fat until the chicken is browned on each side and cooked through. To make the dressing, combine the anchovies, egg yolks, lemon juice, mustard, Parmesan cheese, yogurt, buttermilk and the roasted garlic in a food processor and process until smooth. Season to taste with black pepper. Garnish the salad with the crumbled bacon and more Parmesan cheese.